I love being active and staying in motion. It’s actually recommended that we stay active well into our adult years. Thank goodness I love hiking and running after my almost 2-year-old grandson so much! Many of us have “sit down at a desk” jobs and many even live sedentary lifestyles. How about coming home from work and feeling like doing nothing?! How does one keep active and healthy while working at a desk? Luckily, there’s a solution; check out this TerraMat! You can have any desk at all and still work this into your life, which makes becoming more active achievable even during a busy day. I have both a sit and stand up desk and I have now worked this into my routine and life. 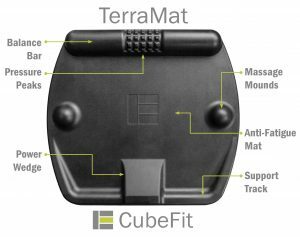 I was approached by CubeFit a number of weeks ago to try out their stand up desk mat called the TerraMat. (BTW: BE SURE and see a special they are offering below!) It is a revolutionary product that features an ergonomic design put together by a personal trainer and engineer. These guys really thought of all angles – literally – the mat’s 3D features offer over 11 different possible stances so you’ll never get bored. More important, it will keep your body moving and it is NOT distracting at all while working! In fact, I find it quite the opposite. I found it alleviates those little aches or those mild to more than mild un-comforts one may get after sitting for hours. Most of us seem to forget to get up, take a break, grab a glass of water, move our bodies, etc. We just keep working away intensely on the subject of work while sitting on our bums. The TerraMat (featured on Forbes and The Huffington Post) is a fascinating product. The mat relieves the burden and pressure from standing all day so you can stand longer without fatigue or aching feet. Thanks to a foam-like material that is 60% thicker than the material used by competitors, the mat’s 3D features help keep you moving and stretching as you stand and burn more calories. How about that? 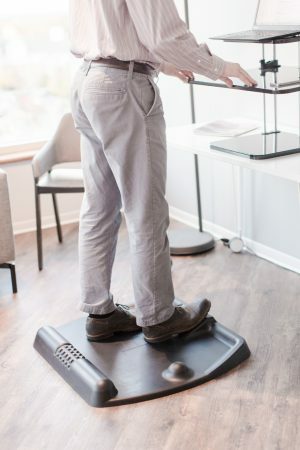 You can actually work out while you’re working! Perfect for my friends that are striving to live the active paleo lifestyle, and for those that aren’t. You can even give yourself a foot massage thanks to the mat’s raised “massage mound”. One of my favorite features. My husband and I gave this mat a try and we both LOVED it. I cannot sit for very long periods due to spine issues, so a stand up desk is vital and the TerraMat was the perfect complement to my desk. I was impressed with the mat’s quality, durability and how sleek it looks in my office, kitchen and den, or wherever I may be working. It really helped my ability to stand for long periods of time and I was able to move the position of the mat around in 4 ways to have various activities or positions of my feet and legs. 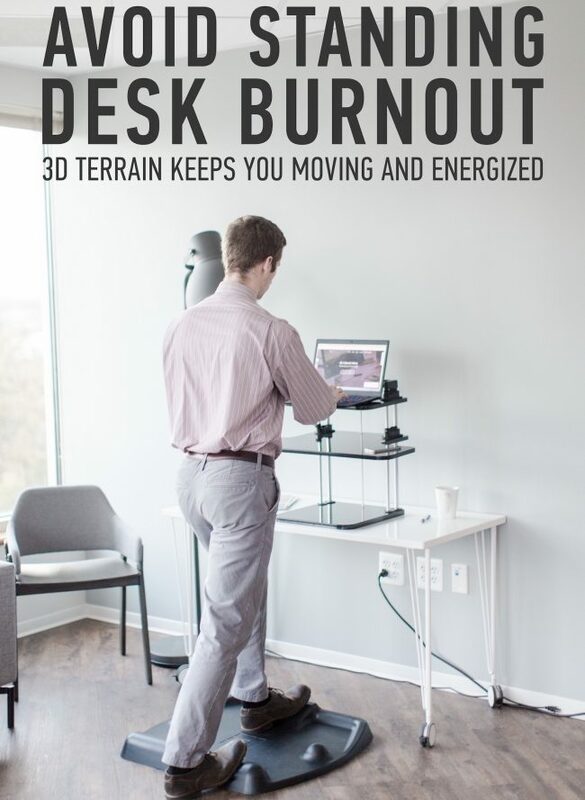 If you’ve ever considered a stand up desk, want to be more active, or simply have a hard time sitting for long periods of time, I highly recommend you incorporate in the TerraMat. You can use it at your kitchen counter or a designated space in your office (if you don’t own a stand up desk). One great point, as far as a purchase, is that if it doesn’t work out for you and you aren’t 100% satisfied the company offers a full money back guarantee. PaleOmazing readers are being offered 10% off the purchase of a TerraMat! To redeem your discount, simply type in “TERRATEN” (all caps) at their Amazon checkout page. I get no monetary compensation. They just generously offered this to my readers only.